Over a 115 MPs have signed a letter calling for the change of the categorization of Sikhs currently listed as a religion, to an ethnic group, for the next census form, which is released in 2021. The previous census saw over 83,000 Sikhs refusing to categorize themselves as Indian, and chose to write Sikh, under the ‘other’ category. Sikhs have been campaigning for this recognition in the census for many years, even though the race relations act of 1976 recognizes Sikhs as a distinct ethnic group. 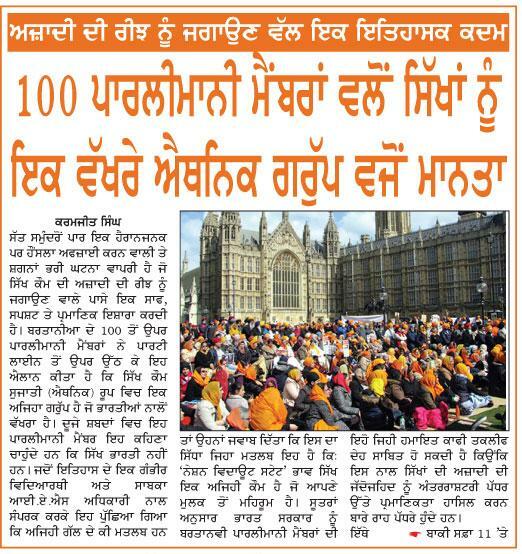 Gurjeet Singh, press secretary for the Sikh Federation UK said that by Monday night, 113 MPs had signed the letter. In an open letter, they stated, “15 years ago the opposition Conservatives working with the leadership of the Sikh Federation (UK) tabled Early Day Motion 1464 on the same subject that had the signature of an amazing 174 MPs and these included the current Prime Minister Theresa May and David Cameron the former PM,” he said. “Sikhs are a legally recognized ethnic group and Sikhs have been protected under UK law following a House of Lords ruling in 1983. A number of issues faced by Sikhs ranging from the reporting of hate crimes through to accessing healthcare provision in the UK are not receiving appropriate attention by public bodies as they often only monitor ethnic group categories specified in the Census. The minority Sikh community has therefore been campaigning in the last two census for inclusion of a separate Sikh ethnic tick box for the compulsory ethnicity question,”.